When Iris was born, her cousins’ gargantuan collection of books hadn’t yet arrived and her then library comprised only a few cloth books. 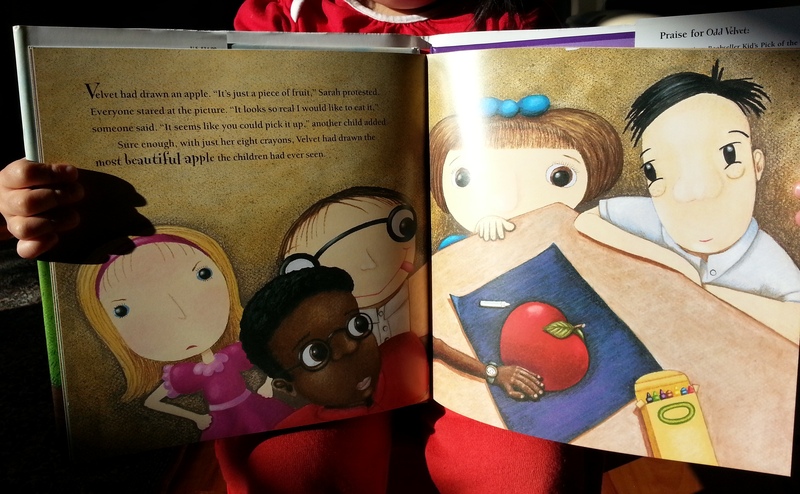 I had learned that when reading to infants, it doesn’t matter what you read, it’s how you read it that matters. So for the first couple weeks, Iris heard The English Patient in a soothing, lilting voice. When I finally got out and about, the first thing I did was go to a baby shop, of course. 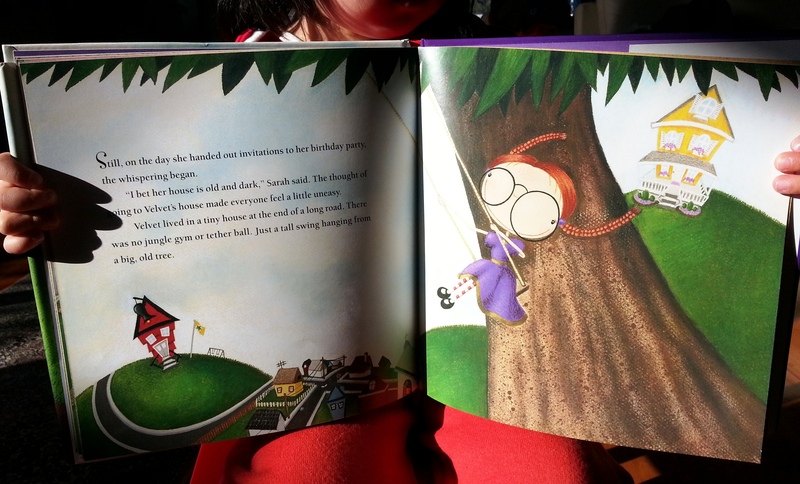 There, I bought Iris her very first children’s book with a proper story and ace illustrations. 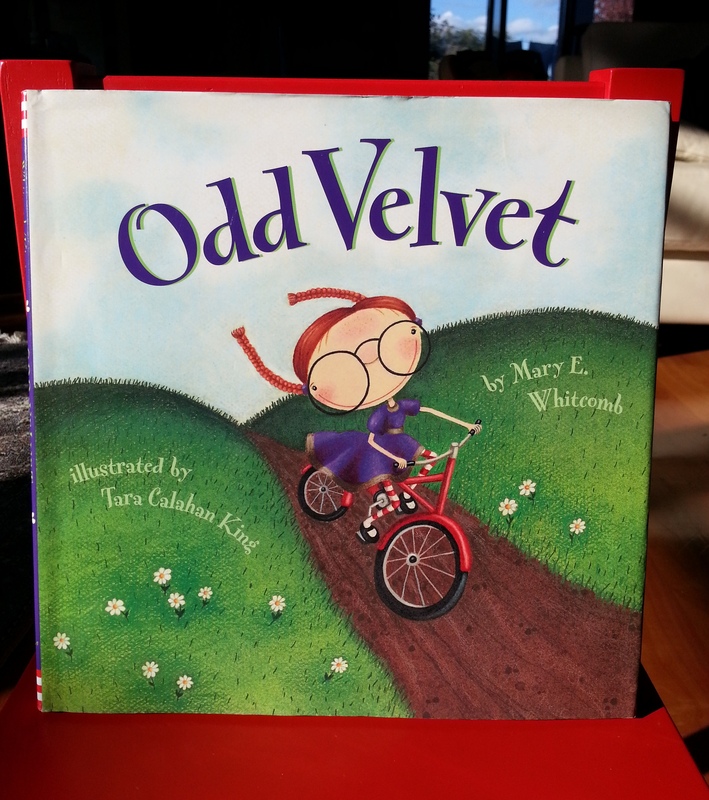 I was attracted to Odd Velvet by Mary E. Whitcomb because of illustrator Tara Calahan King’s vivid use of colours and bold illustrations, purple being my favourite. 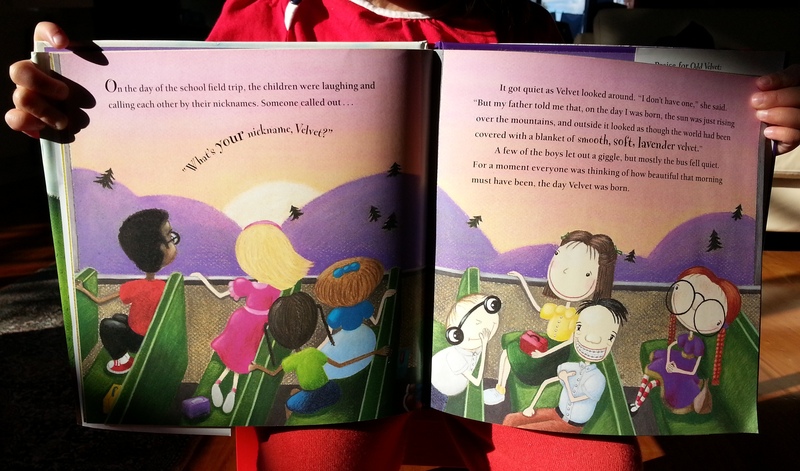 When I read through the story, however, I was equally taken with the theme of social inclusion and individuality. With increasing incidents of online bullying, greater wealth and consumerism, and super brands drilling into adolescent minds that you need to buy into their ideology (and myriad products) or be considered completely out of it, children are growing up with terribly warped senses of self. Therefore, I personally think, the message that we do not all have to have the same things, eat the same foods and like the same things is particularly important. Horror stories of parents buying four-year-olds their own tablet computers and seeing one stroller actually fitted out with a tablet in front of a two-year-old make me run to bury myself and my daughter in my mountain of musty, lovely, solid and wonderful books. Technology is necessary and when Iris is old enough to understand its good and evil components, she can earn her own phone/tablet/laptop. Until then, I will treasure every moment I can read to her, do all the voices and instil in her a love for reading and learning myself. Over time, Iris’s response to the story has evolved, just one of those wonderments of parenthood that gobsmacks me as I watch them happen. From responding to my voice, to liking the time spent at the end of the day close to me and now, finally, actually partially understanding the story and what it’s trying to say. Odd Velvet is a celebration of self, appealing particularly to independent spirits. I always enjoyed being a little different, being my own person and I hope Iris will too. Even if she’s just like all the other kids, that’s okay as well. We don’t need to prove ourselves to everyone, just ourselves and the people who count most in our lives. And, most importantly, it teaches you that rocks can be cool.